Following last year’s launch of PrimeTurning™ methodology and tools for external turning operations, Sandvik Coromant is introducing a dedicated CoroTurn® Prime SL head that makes this process available for internal turning operations. The new SL head will meet the needs of oil and gas, aerospace and other manufacturers that machine diameters in excess of 90 mm (3.5 inches) and overhangs up to 8–10×D. 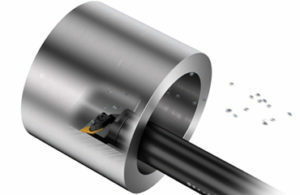 In contrast to conventional internal turning, PrimeTurning™ sees the tool enter the material at the chuck end of the component and remove metal as it travels back out toward the bore exit (inside-out direction). This allows for the application of a small entering angle, which offers significant productivity gains. However, if required, another version is also available with a reversed tip seat that makes it possible to perform PrimeTurning™ in the opposite direction (outside-in). The two insert types for internal PrimeTurning™ are: A-type for profiling, finishing and light roughing; and B-type for roughing to finishing operations. Speed and feed rates can effectively be doubled with PrimeTurning™. This is because the small entering angle and higher lead angle create thinner, wider chips that spread the load and heat away from the nose radius, resulting in increased cutting data and/or tool life. Furthermore, as cutting is performed in the direction moving away from the shoulder, there is no danger of chip jamming, a common and highly undesirable effect of conventional internal turning. With CoroTurn Prime SL heads, customers can create a wide range of tool combinations from a small inventory of adapters and cutting heads. SL heads are available in 40 mm (1.575 inches) diameter and fit with solid steel bars and carbide bars as well as with Silent Tools™ damped boring bars for vibration-free internal machining. In addition, Sandvik Coromant now offers the new -H3 geometry to eliminate any concerns about chip control, which can be challenging when machining low-carbon and high-strength steels. The -H3 geometry is available for B-type inserts in grades GC4325, GC1115 and H13A.